The 'Cedar' stain we used on our living room floor, sandpaper, foam brush, and of course, gloves. Do you love my super-intuitive label for the stain? WOOD STAIN. Really? Thanks for the tip. I couldn't tell by the huge word STAIN right under the label. I barely had to sand this thing because the wood was bare already. But I did anyway, then wiped off all the dust with paper towels lightly dampened with mineral spirits. The mineral spirits wasn't really necessary, but I had gotten a couple drips of stain on the flagstone porch and had to remove them. Then I got lazy and just used the same towel to wipe. Let's just call it 'recycling'. I am so happy with the stain color, it looked brand new again! It's a durable protective clear finish, meant for outdoor wood surfaces that are subjected to water and sunlight. It is also water-based, so I didn't have to worry about covering the driveway, I could just hose it down after. I chose Satin finish because I didn't want it to be shiny. It looked nice after just one coat, but they recommend 4 on the can. What?! It rained about 6 hours after I put the last coat of finish on, and it still looks great! I should have put a tarp over it, but I was lazy. Those are plant stands I'm using as 'side tables' for drinkys. They work great in the narrow space, and were free since I've had them for years. Here is a long shot that includes the amazeballs hanging basket I got for $11 at Walmart! I hate shopping there, but this steal has softened my heart a bit. The door greeter actually exclaimed "Now, that's a big one!" while I was leaving the store, which still makes me laugh. No matter how well this Spar Urethane works, the bench refinishing may be a yearly thing. Ikea recommends oiling it (the bench is made of acacia wood) but I found even while doing that, the bench stained easily from stray flower petals and water spots. We'll see what happens with some extra protection this summer. Honestly, I would have just quit on it. I'm impressed that you brought it back to life... it looks great! 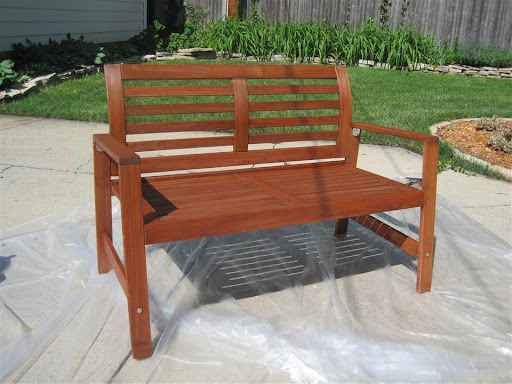 Your bench looks like new - maybe even better than new - and I like the extra little touches on your porch to make it welcoming. I probably wouldn't have thought to bring it back to life either - but you did a great job! I think it looks so inviting. That looks completely new! 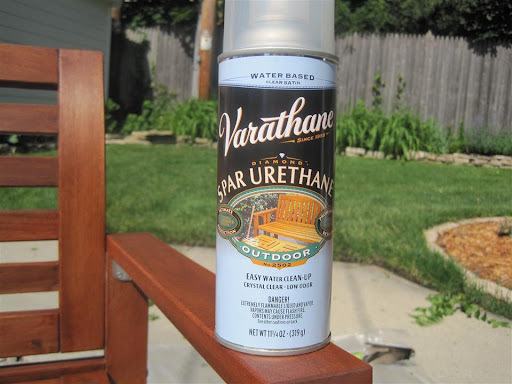 I've heard nothing but bad things about Thompson's water seal products so we avoided using it for our fence. Hopefully this will last longer. Just like Kasey and Kate, I probably would have given up on it, so I'm impressed that you took the situation into your own hands and fixed it. Looks fantastic, and I love the pillows with it too. The bench looks like new!! Great work. I've found that very few wood sealers work as well as they claim. I'm still on the hunt for a truly durable deck sealer. Any tips? Wow! That looks great, it's quite a difference. I think I'll have to try the clear coat. Now the census guy has a nice place to sit while he waits for you! Looks great! What a fantastic little bench! That looks so much better! The color is great with the bricks. Looks awesome! Ugh, I have to do the same thing to our wood patio set (ha!from Walmart). I've been putting it off and hoping the set just falls apart or goes up in flames. Looks beautiful....much more expensive looking than an Ikea bench for sure! Wow, that looks great! But ugh, refinishing every single year? That is no fun. Of course, you could always switch up the stain color, or even go with paint when the mood strikes, if you'll be doing it yearly. Either way, that bench looks 100x better! Nice job. Looks like new! Nice! I'll be following your lead with the bench that we inherited with our house. Whooo! Great job! You gave it new life. I have a love/hate relationship with Walmart. that bench looks great. I have one of my own that not only needs some freshening up, but some revamping as well. I bought it from Rite Aid and it's about 4 inches shorter than it should be for a grown up to sit comfortably. I've yet to come up with a simple DIY solution...but I will. Oh, I will. Just wondering how your bench has held up. I have some lounges that I need to do the same thing to and I am trying to figure out what the best product to use is.